Protesters from ‘Fight Racism Fight Imperialism’ (FRFI) took to the streets of Liverpool on Saturday in response to ongoing disputes in Venezuela. The group was canvassing for support for under-fire Venezuelan President, Nicolas Maduro, while demonstrations were held by both rival factions in Caracas over the crisis. 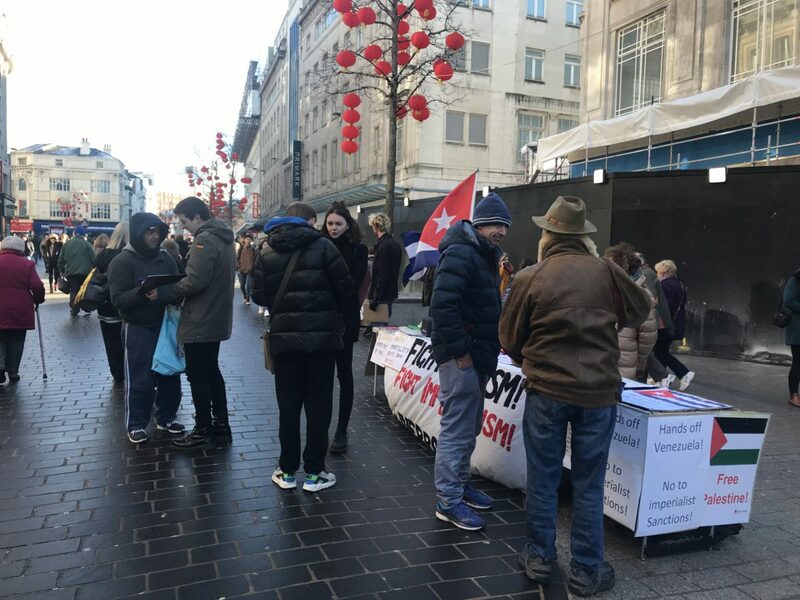 The home-based activists, who label themselves as “an anti-racist and anti-imperialist organisation” spoke out against the British government’s recognition of Juan Guaido as interim Venezuelan President during their demonstration. Guaido claims that current leader Maduro rigged the most recent elections and that his rule is “illegitimate”. He is now claiming to be the ‘rightful’ president of the country and has been backed by the US, Britain, Canada and right-wing Latin American governments. However, the local protest was defiant in its support of Socialist premier, Maduro. FRFI describes the situation as “an illegal attempt by the United States to foment a coup against the socialist government in Venezuela” and urged Scousers to back their cause. A spokesman for FRFI told JMU Journalism: “We are calling on the people of Liverpool to support the Venezuelan people. We are holding a public meeting on Wednesday February 6th in the Caledonia to discuss not only what is happening there but also to organise solidarity action with the Venezuelan people. The protest, featuring around a dozen participants, sparked debate on the streets of the city with many passers-by disagreeing with their stance. Volunteers made an attempt to get shoppers on their side, and pledged to continue to stand up for Maduro and the world’s working class.